In a bid to galvanize women’s football in India, the National Alliance for Women’s Football in India has been set up by CEQUIN, an NGO that promotes gender equality. 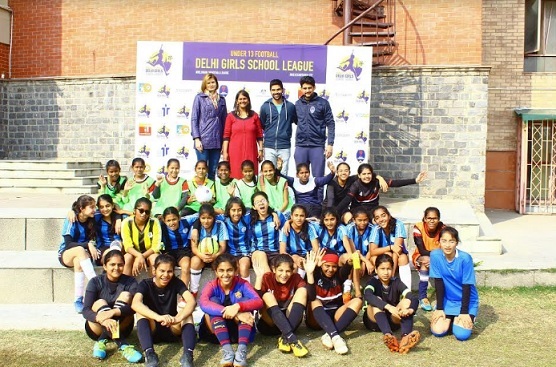 CEQUIN has partnered with alliance members Football Delhi (the State Association) and Delhi Dynamos FC, to address the dearth of opportunities for young school girls to play football competitively at the Delhi state level. The first edition of the Under-13 School League has been organized with the enthusiastic participation of 32 school teams. 10 of these teams are from government schools (who have been trained by CEQUIN), while the rest are from private schools, making this a truly inclusive initiative. The league will feature a total of 384 players divided into 4 zones. Prominent schools have come forward to support as venue partners, including Sanskriti School, Tagore International School and Maharaja Aggarsain Adarsh Public School. A total of seven match days, spread across 1 month will be conducted within the school premises of the partner schools. Top two teams from each group will play the quarter final matches and the grand finale is scheduled to be held at the Ambedkar Stadium, Delhi in February. Talent scouting will be done by Football Delhi for their Excellence Academy, with a view to hone potential talent. This initiative is one of the several strategies being planned by the National Alliance for Women’s Football in India in keeping with its Mission 2030 to bring Indian Women’s Football to the global stage. “It is critical for girls to have an early start in competitive playing, if we really want to see success. The format of this league has given an excellent opportunity to scout talent at an early stage. I hope we will be able to sustain and build on these efforts,” feels Shaji Prabhakaran, President Football Delhi. About CEQUIN - Established in 2009, as a unit of Jai Jawan and Jai Kisaan trust, the Centre for Equity and Inclusion (CEQUIN) is a NGO that promotes equal rights of marginalized groups, especially women and girls, to lead a violence free life, develop their capabilities, have ownership, control of resources and inclusion in decision making. CEQUIN works across a wide spectrum of areas affecting women and girls such as violence, leadership, economic empowerment and wellbeing. To accomplish these objectives, CEQUIN works with adolescent girls, women and various other stakeholders. Currently they are operational in the urban slums of Delhi and the Mewat district of Haryana. About Football Delhi - Football Delhi is the governing body of football in Delhi. FD partners with clubs, facilities owners, coaches and all other elements across levels of the football ecosystem to create an environment that’s healthy and conducive to maximising participation and achieving excellence in the sport. About Delhi Dynamos Football Club - DDFC is an Indian professional football club based in Delhi, which competes in the Indian Super League and as the only ISL club in Northern India, it has a catchment area of over 300 million people.